Seeing as Autumn is finally here i decided it was time i break out the autumnal makeup, ive been hunting for the perfect olive/green eyeshadow for a week or so now, with a few mishaps in my search, bottle green and 'halloween' green i have established does not suit me, i have found the perfect little gem for my skin and eye colour! 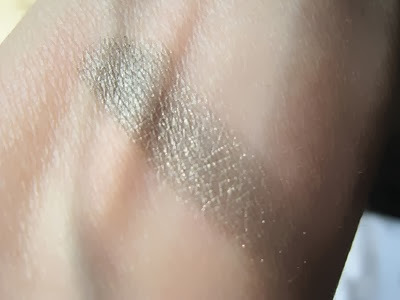 Lancome Ombre Absolue Shadow in 1202 - Erika is the most beautiful subtle olive green, with a light dusting of shimmery glitter running through it, apparently according to many bloggers out there this has been a very hyped up, talked about colour, which i hadn't actually ever heard of, it was only when i was on a recent trip to Boots i decided to have a look at Lancome's recent offerings i discovered this little gem..
Secondly i purchased the Cils Booster XL - essentially a mascara primer which gives you exceptionally long plump lashes in one coat, it has small fibers inside the mixture which prime and protect the lashes whilst enhacing the colour of your mascara once applied..
You apply this to clean lashes as you would your usual mascara, allow it to dry then apply your regular mascara on top of it and you have amazing looking eyes in a flash, i actually didnt expect it to make a huge difference but i was so shocked to see how long it made my lashes look, i can definitely tell the difference when i dont use it now! Lastly i picked up the Ombre Hynose Mascara in Brown, my reaons for picking up my FIRST ever brown mascara were due to a few YouTubers who i hear keep saying brown mascara works really well for blue eyes and for a pale skin, which is exactly me, ive been thinking for a while now that black mascara is too harsh on my face so this is the perfect balance for me, you cant actually really tell that its brown once its on, it just looks alot softer on my face than a regular black mascara does! I really love the wand on the Hypnose mascara, it has a curved shape to it which make its really easy to define the lashes and gives you a really lovely curl to them which holds all day! Everything looks divine, especially the Cils Booster XL. That's definitely going on my wishlist. That eye shadow color by Lancome is Amazing!! I have been looking for a shade like that..Thank you!! That eyeshadow looks gorgeous and congrats on getting a baby sister!!! We love and swear by the CILS Booster!!! It is amazing! Great post! Absolutely love Hypnose Drama. Used to really love Hypnose Star but have recently been converted. Makes eyelashes look sooo long! Love the eye shadow shade, it will suit most skin tones. Doll eyes is very popular for us but I just love Hypnose Classic. A lot of people don't think about brown but I love it for a change. Great post. And congratulations on your new wee sister! Looks pretty! In the pan I thought it was silver but the swatch is totally different! That eye shadow is stunning! It's very deceiving in the pan. Wife, Mum to be, Lover of white interiors, candles and a total perfectionist! Follow me on my journey through this weird and wonderful thing we call life! The Quest To Long Healthy Hair..
My Current Makeup Storage & Collection..
eve lom - kiss mix..
yves saint laurent - volupte's..
skyn iceland - icelandic relief eye cream..
Maybelline Colour Tattoo - Pomegranate..
Beauty Haul.. House of Fraser, Boots & Lush..
#RushBloggerMeet at Rush Hair & Beauty..
© Frankie Amelia . All rights reserved.